Local Stops: What A Long Week! This season I have partnered with TiqIQ to bring you '81 days in 203'. a series of articles breaking down the life of a super fan. 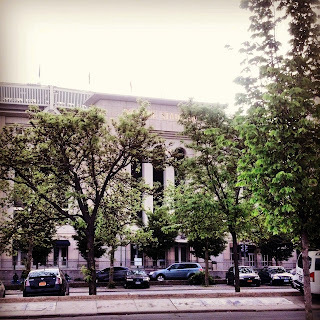 '81 days in 203' articles will be featured on various Yankees blogs within the TiqIQ network of blogs and will be posted throughout the 2013 season. 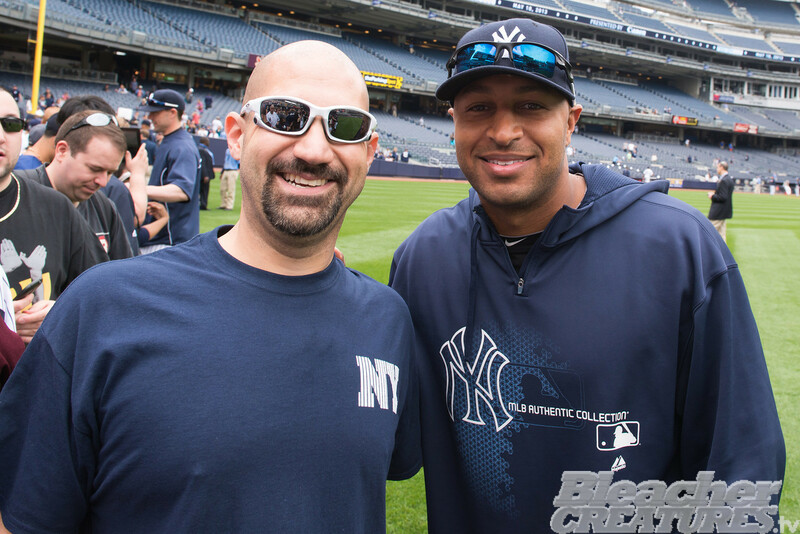 TiqIQ now offers tickets directly from the Yankees ticket exchange, the official resale marketplace of the New York Yankees. I've been really slacking on my writing duties this week, and I apologize for it. I've been running around like mad, and kept putting off the blog in favor of other priorities. But fear not, loyal reader, for I have returned to re-cap some events from last week (it'll be like two blogs in one!). 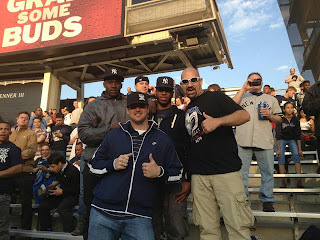 The first blog worthy event happened on Wednesday when we welcomed not one or two but THREE members of the NY Football Giants out to 203 to join us for Roll Call. 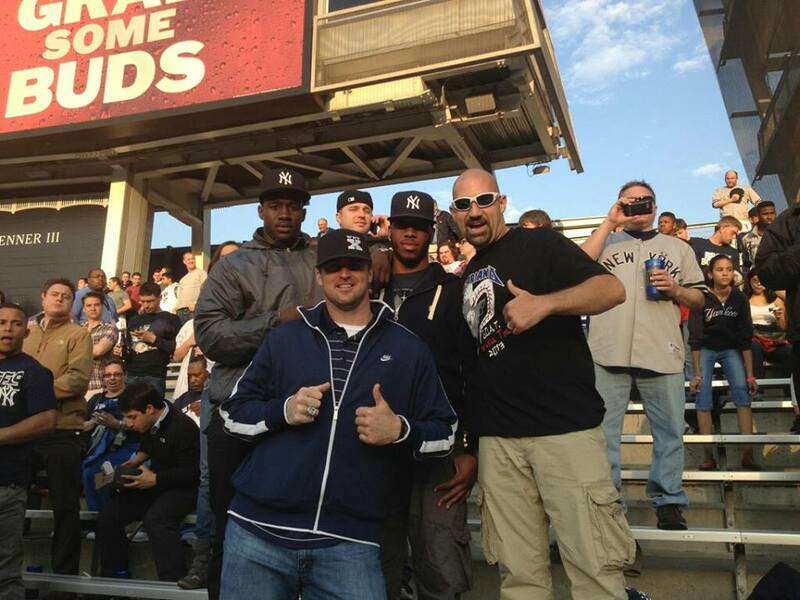 By my count, this would make the 4th, 5th and 6th member of the Giants to join us in the bleachers (David Baas, Chris Snee and Justin Tuck were the first three). Before I get to the video link, I'd like to call attention to something in the photo above. Take a look, if you will, at the background of that photo. See the guy standing between David and Rueben, talking on the phone? He's not really talking on the phone. And that guy on the right in the away jersey taking a picture? Yeah, he's not really taking a picture either. Those two guys would be Jersey Steve and Mike Donahue, long time Bleacher Regulars. 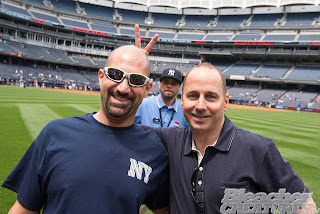 They are partaking one of the newest trends to make it's way out to the 203, photobombing Bald Vinny pics. It happens quite a bit (and I mean a LOT!). 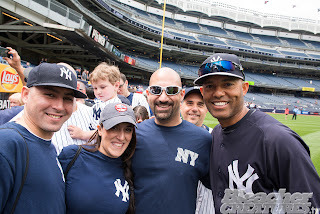 So much so, that I've created an entire Tumblr dedicated to my photobombs. Anyway, back to the Roll Call video, you can check it out here. Of course, there was a really good reason as to why I would head to the stadium a good 3 hours before I would normally arrive for a weekend game, and that was to attend the second annual Yankee Stadium Photo Day (for season ticket holders). 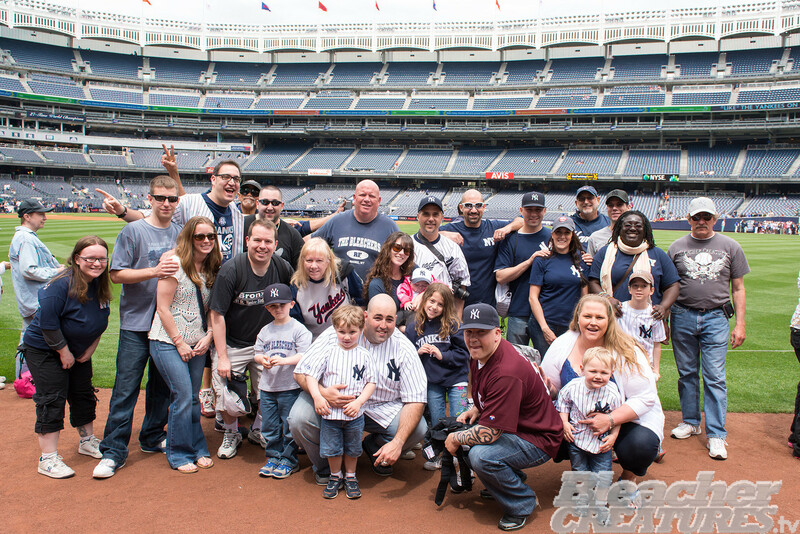 The Yankees have recently begun a few efforts to "connect" with their fans, and photo day is by far one of the best. Fans line up around the warning track, and players (as well as some of the broadcast team) walk the warning track, shaking hands and taking pictures. I won't make you all incredibly jealous with all of the amazing pictures we got that day, but I will share a few of my favorites (you can check out the whole gallery here). Posing for a shot with the G.O.A.T. As if this day wasn't awesome enough, it continued in its awesomeness well into the night. After the game, I headed in to Manhattan to lend support at a fundraiser held at my favorite bar in the city, Foley's. 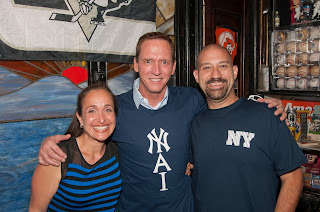 The event was for the YAI Network (an excellent organization dedicated to creating hope and opportunity for people with learning and developmental disabilities) and featured our old friend, David Cone, as a guest bartender. I love Foley's, I love Cone, and I love being able to help out ( I donated "The Ultimate Bleacher Creature Package" as a raffle prize) so going to the event was a no-brainer. To top it off, we were able to drop the kids off at my parent's house, and Rose and I had a chance for a rare date night. Needless to say, Sunday was pretty rough. Waking up to rainy skies (and then, standing in said rain for 5 hours) didn't make it any easier. Thankfully, we were (slightly) spared and the afternoon game was a wash out. But, in the end, I wouldn't trade a minute of it. As I used to say (in my much younger days) "You can sleep when you die". Geez, not only did Cash give you bunny ears, but both pics with him got photobombed by the staff guy behind you. Classic.